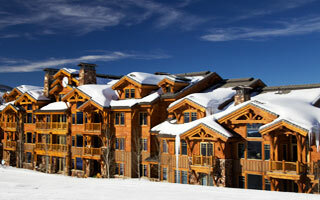 Just steps away from Deer Valley Resort’s Northside Express chairlift, The Grand Lodge brings new meaning to luxury. From the exquisite stone and wrought iron architecture to the premier ski-in/ski-out access, these luxury condominiums offer the privacy and exhilarating beauty that is only imaginable in a world-class resort. These spacious three to six bedroom residences have been designed to take advantage of both the mid-day sun shining over Flagstaff Mountain and the glorious down valley views of Park City. Each residence features hand hewn beams, custom cabinets, granite countertops and Sub Zero appliances along with exquisite furnishings that will satisfy the most discriminating tastes. The Grand Lodge’s two common area hot tubs, ski locker room, ski valet service, steam room, fitness center, guest lounge and on-site concierge provide an environment where family and friends connect to make life time memories. Come explore The Grand Lodge and experience one of Deer Valley’s hidden treasures. These luxurious Studio style condominiums feature a full kitchen, fireplace, washer & dryer combo, a convenient ski in ski out location and breathtaking views of the Empire pass area of Deer Valley. Condominiums feature ski-in/ski-out access, full kitchen, spacious living room and dining area, fireplace and breathtaking views.